Hey, Myrtle, how you doing? Yeah, Spring’s sprung, looks like. Hey, Myrtle, you missed a blast yesterday out at that old graveyard next to the Second Baptist Church. Huh? Cause that’s where we had the egg hunt for the church daycare this year. Yeah, the daycare kids. Anyway, this year we decided to jazz it up a bit so we could get a few more grown-ups interested, what with just me and one other volunteer not being quite up to running around a graveyard with twenty 4 year olds. No, the kiddies are not 24 years old, Myrtle, we had 20 of ’em, all of them were 4 year olds, more or less. Couple of threes, one or two fives. Jazz it up? Make it more fun, Myrtle, more fun! Well, we decided since the Halloween Costume Contest went over so good we’d try our hand at Easter costumes. You know, Roman soldiers, apostles, angels, that kind of thing seeing it was the day after Good Friday. Naturally we had to allow Peter Cottontail and such, too. Even had one little kid in a jump suit stuffed with plastic grass made up like an Easter basket, can you picture it? Okay, I’m getting to it, where’s your patience, Myrtle? Me? A chicken suit left over from the egg jamboree last year, Myrtle. I figured what with baby ducks and Easter bunnies and all I might as well. Yeah, I looked pretty funny, all them feathers were molting pretty bad by now but I looked better’n some of them. Imagine a 200 pound Easter egg with legs? Humpty Dumpty. Yeah, that was the preacher, guess his wife couldn’t find anything else to fit him and he wanted to “fit in!” That was a joke, Myrtle. He did look pretty funny, though. Well, I had the job of hiding the eggs and the old cemetery hasn’t been used in years but it does have Perpetual Care. Perpetual, Myrtle. Forever? Always? Yeah, they mow it regular and call it perpetual care. Anyway, it had been a week or so and there was plenty of easy hiding places, not too hard for the little ones, you know. Anyway, I had most all of the eggs hid real good, some nestled up right against the wall under a handful of pine straw, some under a clump of weeds, nothing too hard to find. But I wanted a real special place for the prize egg, you know, the plastic one with the dollar bill in it, so I was rooting around a couple of the old markers. Why? Cause they had tall grass growing up close where the lawn mower can’t get. Yes, if they had been mine I would’ve been more persnickety, Myrtle, but they wasn’t and they wasn’t. Course, with all them old markers, some of the tall Confederate ones and some of those odd shaped Woodmen of the World you really got to have one of them weedeaters – well, none of that is the point, Myrtle. Let’s stay on the subject here. So I was pulling on one of them tall clumps aiming to make a little hole down beside the marker to put that prize egg into and darn if a square of grass didn’t come right up, just like that clump was a handle! It was a square of sod, Myrtle. Sod, you know, like when you don’t have patience to plant seed and you just buy a ready-made lawn all rolled up like carpet? And it was just a little bit overgrown so it didn’t look any different from the rest of the grass out there. Well, it came up pretty as you please and uncovered a square hole in the ground. You’ll never guess what was down there, Myrtle! Nope, not a coffin. Well, six feet or so further down there probably was a coffin. No, I don’t know whose coffin it would have been, Myrtle, I didn’t note the name on the marker. No, their family might not have liked it if they had known about it, I agree. Unless it was their box. A box, Myrtle. In the hole. It was just a foot or so deep and there was this metal box with a locked lid. Yeah, locked up good and tight. Now, you know me, Myrtle, I don’t snoop into nobody’s business as a rule. But the more I looked at that box and that hole and that piece of sod grass, the more I thought there was something mighty peculiar going on here. Maybe some snooping was in order. So I left that box in the hole and patted the grass square back down on top of it. I figured there was no sense ruining the day for all them 4 year-olds chomping at the bit for the egg hunt and costume contest. I found another spot for the prize egg like I didn’t know nothing about nothing and headed back to the fellowship hall, me, my feathers and all. Now, Myrtle, I knew better than to blab it right out, what’d you think? Course I did put a bug in Humpty Dumpty’s ear. The preacher, Myrtle, the preacher, remember? And we placed a nice quiet telephone call to the Sheriff. Yeah, I still had his card from the other month, I keep it in my wallet next to my driver’s license, you never know when something like that might come in handy. One of them plain-clothes deputies showed up in a few minutes in his plain pickup truck. He just mingled with the crowd of mamas and grandmamas and all like he was just driving by, kind of casual. By then we’d had to turn loose all the young’uns for the hunt and I was out there helping one of the kids hunt round the edges. To keep a watch, Myrtle. You know, to see if anybody was showing any special interest in that particular plot. Yeah, it didn’t take too long to spot who it was. One of the new daycare helpers meandered herself right over to it, then proceeded to stumble and fall. She hunkered right down on top of that patch of grass, claiming her ankle was sprained. So nobody else would find it I guess, Myrtle, why else? 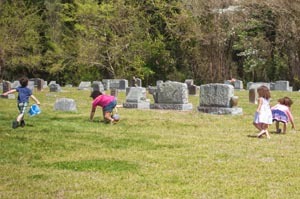 I bet they had a conniption fit when we picked that old cemetery for the egg hunt this year. They must have got some nervous about their hiding place and sent her to stand guard – or sit guard over it, in this case. Well, that’s the best part, Myrtle. The preacher came over and sat himself down right next to her, to keep her company he said until somebody could check her hurt foot. That let all the kiddies finish up their hunting and go back to their refreshments safe and sound, see? Then the deputy and the preacher pulled that box right out of the ground, and you never heard such spluttering and fuming and x-rated language coming out of such a pleasant looking face! Yep, Secret Service, SLED, TV cameras, the whole nine yards, and a five hundred dollar reward to boot! And I got me another half dozen business cards, too! So you missed a real blast yesterday, Myrtle, no doubt about it. It was a real blast.